This postcard has a picture of a man who was a tourist attraction in the New Forest. 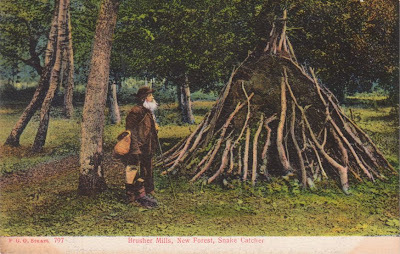 His Gravestone tells more... Harry Mills better known as "BRUSHER MILLS" who for a long number of years Followed the occupation of Snake Catcher, in the New Forest. His pursuit and the primitive way in which he lived, caused him to be an object of interest to many. He died suddenly July 1st 1905, aged 65 years. The Brusher Mills Webpage has a lot more research. I do find it moving to be able to jump from an old postcard to a real person that has been researched and well documented on the internet. He was considered curious and old fashioned in 1905. But in 2011 he could be on the way to becoming an internet legend. There is a pub in the New Forest called The Snakecatcher that had his photo and story on the wall. It used to be a really popular place. I expect it is just a restaurant now!